I decided to celebrate the release of Lovecraft by submitting another theme that I have been tinkering with for the last couple of months. 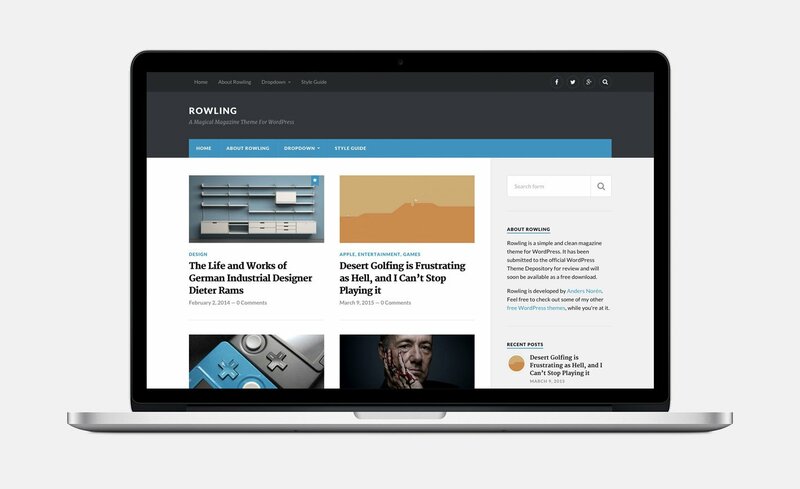 My latest theme is called Rowling, and it is a clean, simple and elegant magazine theme for WordPress. Rowling features a responsive design, great typography, two menu locations, social menu support, custom accent color support, custom logo support, gallery post format support, editor style support, a Flickr widget and recent posts and recent comments widgets with thumbnails. All the cool stuff. You can check out the demo site if you want to see it up and running. Judging by how long it took Lovecraft to get released, I’m betting it could take anywhere from two to three months before Rowling is available for download.